Occasional musings about farm life and what's happening at the farm. 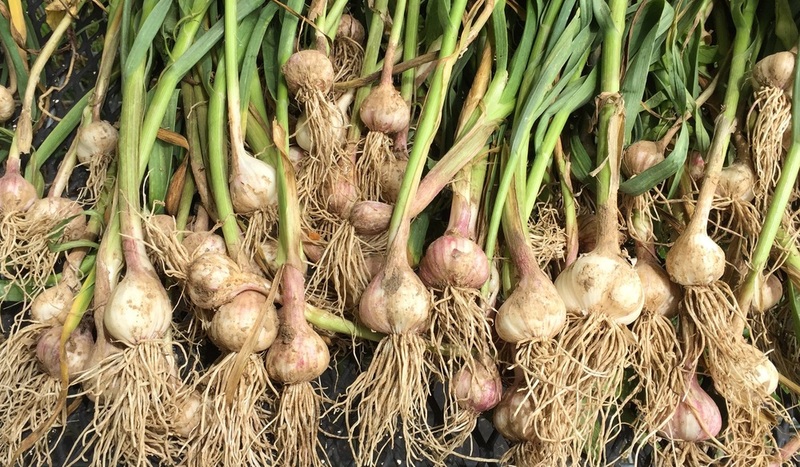 We just started harvesting the 2015 heirloom garlic crop. So far, the garlic's looking good. Very good. Estonian Red, Chesnok Red, Penasco Blue and Susan Delafield were harvested over the weekend. The bulbs, as you can see, have good size, good clove development and plenty of bulb wrappers for good storage. But boy, were they muddy. It's been raining almost every day for the last week. Weeds are growing like mad, and we're digging bulbs as fast as we can. Keep your fingers crossed that the rain keeps draining quickly so we can continue harvesting! Here's what Chesnok Red looked like when it came out of the ground. The bulbs were nice and big, but a lot of muddy clay clung to those roots. Not fun for harvesting. If you've been looking for an inexpensive way to increase your heirloom garlic seed stock, try growing garlic bulbils. We planted about 100 Korean Red bulbils last October, each about the size of a small pea. Most grew into small bulbs with actual cloves, while others grew into a single round. We'll plant the whole lot this fall. Then we'll be on the path to expanding our Korean Red offerings--and doing it at low cost. Want to try this in your garden this fall? We're growing bulbils now and will have them available for sale in a few weeks. We'll be offering Korean Red, Susan Delafield, Tuscan, Khabar and more. Check back or contact us for an updated list! Korean Red garlic that we grew for the first year from bulbils. Most formed cloves, which is amazing for their first year. We'll plant these cloves and garlic rounds in this fall to increase our stock for 2016 and 2017.